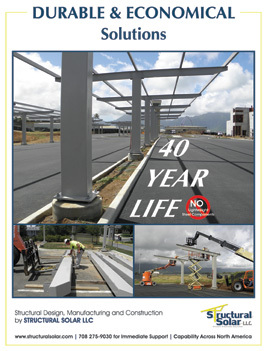 Structural Solar LLC is a leading design-build company who specializes in attractive solar canopies for institutional, municipal and commercial solar installations. The highly attractive solar canopies are also durable and cost efficient alternatives to rooftop solar installations. The company manages the design, fabrication, coating and installation of foundations and “module-ready” solar structures, most notably attractive solar canopies in parking lots or elevated canopies in common areas of the property. Structural Solar LLC is a leading supplier of attractive solar canopies to solar integrators developing university, hospital and other institutional and commercial solar projects where aesthetics provide an inspirational edge. The company has been recognized for award winning design on high profile institutional and municipal projects and can provide signed and sealed structural drawings for projects across North America. As a solar canopy company, Structural Solar designs to stringent specifications assuring durability and long term customer satisfaction. Moreover, Structural Solar provides customized curved and linear designs to meet the most demanding critics and provides industrial -marine grade paint systems that are virtually maintenance free for the design life of the structure. Structural Solar utilizes an ultra-efficient design process and can take the project from concept to completion quickly and seamlessly. Accordingly, the company has become the premier solar canopy supplier for solar installations on the East Coast, Midwest and mid-Atlantic regions, and continues to grow across the US and Canada. Structural Solar LLC designs and builds durable, economical and attractive “module-ready” solar canopies. For more information on how the company can make a difference in your project, call or visit the website of the solar canopy company who can get the job done, on time and within budget.